This is a bit late but I have been busy. So its pretty old news now that yes many of the ‘New’ UI improvements in iOS7 have been around for awhile. Many via Jailbreak. So say something you really liked in iOS7? Check out this list. Odds are you can have it. However, before we start, a quick rant. One of the things I love about jailbreak is that I can customize the phone to work the way I do. I can also customize to satisfy my tastes. The biggest thing I was looking for is iOS7 was the ability to have Themes. Something we have had in Jailbreak since forever and is one of the more popular reason people jailbreak. Apple decided to change its Theme. Like it or not, that is what you are getting. FAIL. BTW, there will be a Jailbreak for iOS7, just give it time. Not sure about an Unlock though. This is a first pass list BTW, I will be editing and improving as time goes on. I love SBSetting and finally it seems Apple is feeling the love. However, they still have a way to go. SBSetting is control center times 3. 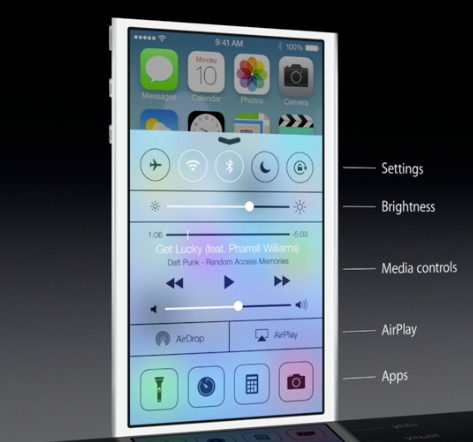 Although Control Center feels more OS’ish, it lacks many of the customizations I’ve come to expect from SBSettings. There is also NCSettings, which has a few bells, but I have not tried it. I do not use this because I have an older phone and like to know what is going to be updated or not before I do it. However, should my next phone be Apple, I would have installed this, if Apple did not already do it. Its a great feature that Android has had for awhile now. How more direct rip off can you get? LiveClock changes the clock icon to actually tell you the proper time. Neat. So what does Apples LiveClock (noticed the same name?) basically the same thing … except you cannot customize it. App switching is a big missing element in iphones. Yes we can do it now, but its clumsy. Auxo looks to address that by using the WebOS inspired approach. Its was a little buggy for me so I do have it installed anymore. I read Dash is pretty good but I have yet to try it. Did you really dig those unlock animations you saw? Go get UnlockFX and feel the love. I have a few hacks running around the unlock screen so I did not want to invite a conflict, but I never tried it so it might be fine. So now you can finally out folders into folders! BRILLIANT! How did they think of that? Oh that’s right. Infinifolders. They did a nice job though. There are TONNES of flat design themes out there you can download via Jailbreak to give your iOS a cleaner, dare I say it, METRO look. Finally Apple has decided to take this route (I’m not saying its better or worse) but what is annoying is you do not have a choice. YOU WILL HAVE THE FLAT ICON DESIGN AND YOU WILL LOVE IT! Right. I think that is one of the key annoying things about Apple. THEY decided the old icon are not good enough anymore and THEY decided what the new design is. Having a choice of so many themes, I looked at the new design as yet just another Theme idea. Its nice, some things I like, something things I do not. But with Jailbreak, I get to CHOOSE what I want. So now iOS7 lets you have unlimited tabs. Cool. You can do that now using Tabs+. Although I would bet Apple is better about memory with this. … I need to add more. Suggestions anybody?